Various Unitek programs prepare students by giving them access to healthcare facilities, simulation training, and extensive instruction. Most of these programs can be completed in a year or less, and in some cases, General Education courses are entirely online. The Fremont Campus is located near the I-880 highway. Tucked into the corner of Auto Mall Parkway and S. Grimmer Boulevard, the campus is located near a 24 Hour Fitness and several restaurants. Unitek College was founded in 2002. 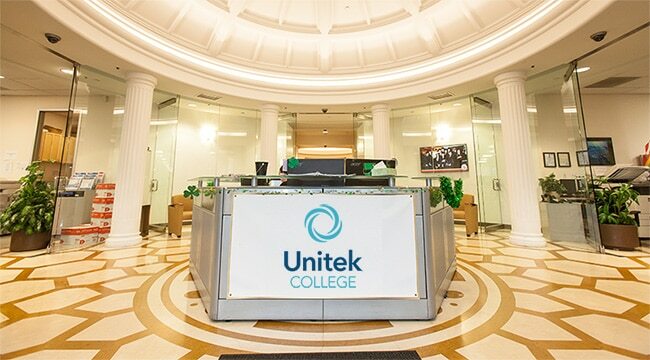 An accredited, private institution, Unitek maintains seven campuses in convenient locations. They can be found in the following areas: Fremont, San Jose, Hayward, Concord, South San Francisco, Sacramento, and Bakersfield. Unitek combines academic and technical specialties to create a truly exceptional set of programs in the areas of healthcare and nursing. Career training, clinical placement, and employment assistance are provided to graduates of Unitek College. Vocational Nursing program in Fremont: This program gives students the knowledge and skillset they’ll need to pass the licensure exam in as little as 12 months! If you like to help people, this program could be a great choice—healthcare careers are often incredibly rewarding. Bachelor of Science in Nursing Degree in Fremont: Students can take the next step in their nursing careers with this 3-year program. Students with current LVNs can also apply for advanced placement status and complete the program in 2 years. Medical Assisting classes in Fremont: This program equips students with the experience and skills they’ll need to excel as a Medical Assistant. A supervised externship is included! Medical Office Administration courses in Fremont: Learn how to provide excellent patient administration with this program. Students will learn about medical office procedures, patient interaction, medical records, and more. Information Technology course in Fremont: The program prepares students for a career in a growing field. It accomplishes this with extensive instruction, lab work, and a supervised externship.